This location also open Thursdays. GrowNYC's Food Scrap Composting: 8:00 a.m. - 1:00 p.m.
Greenmarket's gateway to the Upper West Side, the Tucker Square Greenmarket, offers locally grown produce just across the street from Lincoln Center. Seasonal vegetables range from fresh staples like corn and greens to delicacies like squash blossoms and fairtytale eggplant. Orchards boast sweet berries, stone fruit, and over 80 varieties of apples. Knowledgeable growers are at market to explain just how to care for their plants, flowers, and herb pots indoors and out. Impeccable farmstead cheeses, fresh seafood, grass fed beef, duck and duck charcuterie, eggs, artisanal baked goods, and New Yorks only producer of both sorghum and maple syrup round out the offerings. Includes cooking demos, seasonal celebrations, and family friendly activities. Locust Grove Farms, OP Kent and Sons Orchard fruit, berries, grapes and squash; cider and baked goods from Ulster County, NY. One of Greenmarket`s founding farmers in 1976. Stokes Farm Herbs, flowers and plants, heirloom peppers, eggplants and tomatoes from Bergen County, NJ. One of Greenmarket`s founding farmers in 1976. Ivory is a Crown Heights native in his second year with Greenmarket. He attended college in New Paltz, NY, where his fascination with indigenous American food and agriculture grew into a desire to learn about sustainable food production. 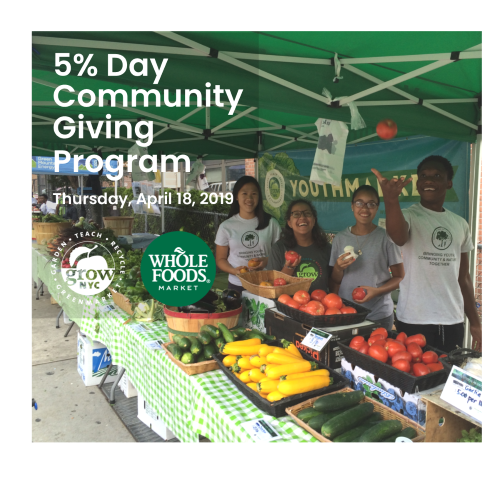 After learning about GrowNYC's efforts to educate local populations, support family farms and local businesses, and make healthy, fresh food choices readily available to people of various economic backgrounds, Ivory was excited for the opportunity to work for Greenmarket. He hopes to bring an appreciation of local food and excellent service to the community through GrowNYC.